If carving a pumpkin sounds unappealing, there are many other unique, no-carve ways to decorate a spooky jack-o-lantern for Halloween. Pumpkin carving kits and stencils aside, decorating a pumpkin for Halloween without carving is a great alternative. Without carving, a pumpkin will last a lot longer, will not get all moldy and black, and can be preserved for a great pumpkin soup or pie recipe. 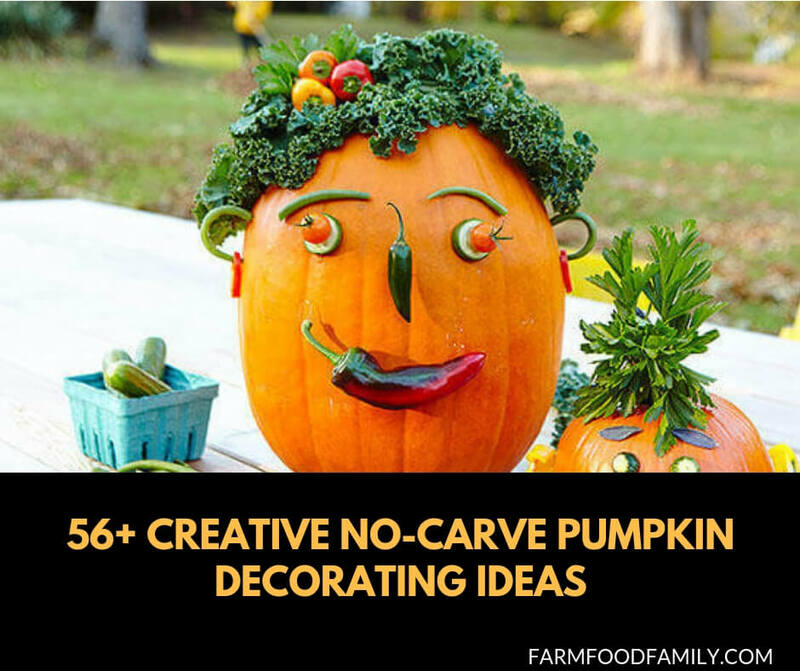 If scooping out the seed-laden, goopy, and stringy pumpkin mess doesn’t sound like much fun, try a few of these no carve pumpkin decorating ideas for Halloween this fall. Using a Mr. Potato Head kit, place eyes, nose, mouth, ears, and feet onto a small pumpkin and this will be one of the quickest and easiest ways to adorn a pumpkin without carving. There are also many varieties of Mr. Potato Head kits available especially designed for Halloween pumpkin decorating, such as pirates, princesses, ninjas, and other spooky characters. Don’t have time to get to the store for a pumpkin decorating kit? Try decorating the pumpkin with pushpins and recyclable plastic items such as water bottle covers or sturdy paper decorated and cut to look like eyes, nose, and mouth. Traditional Jack-o-Lantern. Make a traditional jack-o-lantern face using triangular cut pieces of black duct tape. Spooky Cat or Bat. Wrap a pumpkin with black tissue paper and make a spooky cat or bat with pieces of construction paper, silver and gold glitter glue, and jewelry wire for whiskers. Scary Painted Face. With nontoxic markers or paint, turn the pumpkin on its side and with the stem as a nose, draw a spooky Halloween face on the side of the pumpkin. Attach mop string or fiberfill on top to make hair, if desired. Sticker Pumpkin for Children. For young children, have them adorn a small sugar pumpkin with scary Halloween stickers. Spider Infested Pumpkin. Cover the pumpkin with scary Halloween spider webs and plastic black spiders. Pumpkin Mummy. Wrap the jack-o-lantern with white gauze and place googly eyes on it for a unique pumpkin mummy. There are a huge amount of free pumpkin stencils available online and in Halloween magazine issues and many of them are really fabulous. However, the thought of trying to carve a pumpkin using an intricate pumpkin stencil pattern can give anyone the creeps. Instead, try using a pumpkin stencil for tracing or glittering a pattern onto a pumpkin. For either method, secure the pumpkin stencil onto a large round pumpkin free from blemishes. For glittering technique, put a good amount of glue onto the pumpkin pattern area and then sprinkle the glitter. Wait until the glitter dries slightly before removing the stencil and admire the results. Drawing using the stencil is even easier. Use all different colored nontoxic markers (or paints) to trace the pumpkin stencil design. Say goodbye to the sticky, moldy pumpkin mess this Halloween by adorning the Halloween jack-o-lantern without carving. With the above no carve pumpkin decorating ideas there are endless possibilities for uniquely decorating a pumpkin. Especially if young kids are involved, they will love these no mess methods of designing a pumpkin without even picking up a carving utensil, and the resulting jack-o-lantern will be just as spooky and pleasing.